WILLIAM PINKNEY. 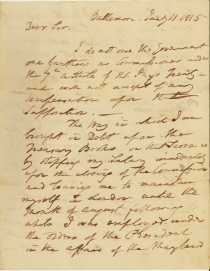 Autograph Letter Signed, Baltimore, January 11, 1815, to Richard Forrest. I do not owe the Government one farthing as Commissioner under the 7th article of Mr. Jay’s Treaty – and will not accept of any compensation upon that offer now. The way in which I am brought in Debt upon the Treasury Books on that score is by stopping my salary immediately upon the closing of the Commission and leaving me to maintain myself in London until the month of August following while I was employed under the orders of the President in the affairs of the Maryland Bank stock.- I sent you some time ago a full statement upon that business - with an account of the Credit which I expected and vouchers to prove that the General Assembly of Maryland made me the present which was vowed to me upon an assumption that I was to receive (or rather had received with Mr. Monroe’s assent) my salary from the United States. I begged you to present this statement account voucher to the proper Department and I relied confidently on the justice of the government for the allowance of what I claimed. Please, do let me know what was done with these papers. In the meantime I repeat that I will not accept of any show of a compensation and that the placing the $1,000 and the balance of my salary to the credit of my Commissioners account is that and nothing more. 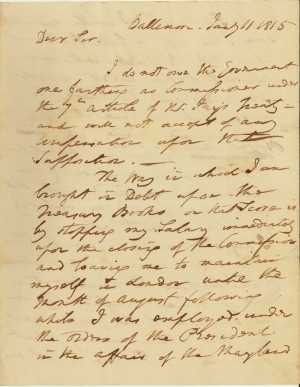 Article 7 of Jay’s Treaty called for five commissioners (three American two British) to hear claims for compensation from merchants whose ships and property suffered damage “during the course of the War in which His Majesty is now engaged.” Commissioners were to sit for 18-month terms; Pinkney’s stretched from 1796 to 1804. His service also included four years as ambassador to Great Britain (1807-1811), a year as Attorney General (1811) and military service in the War of 1812, during which he was seriously wounded. After the war he became U. S. minister to Russia, served in the Senate, and enjoyed a lucrative practice at the Supreme Court bar. He argued the winning side of two of the landmark cases before John Marshall, McCullough v. Maryland and Cohens v. Virginia.